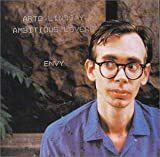 Ambitious Lovers were a dance-pop musical group composed of guitarist/singer Arto Lindsay and keyboardist Peter Scherer, active from the mid-1980s to the early 1990s. Their music incorporated elements from Brazilian music and funk. Despite strong reviews from critics for their three albums, Ambitious Lovers found little success with mainstream audiences.